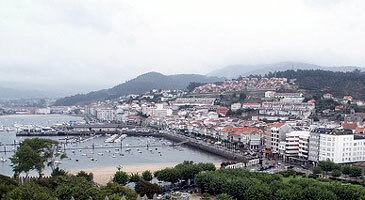 Baiona is a medium sized coastal resort town located in the south of Galicia and found in the Pontevedra province. It mixes a long history and some interesting monuments with modern day tourism and has many hotels and rentable properties. As a result of its comparative southerly location, Baiona enjoys a warmer, sunnier and drier climate than many other parts of Galicia, yet it rarely gets uncomfortably hot. For this reason Baiona has become a popular summer retreat for many Spaniards who leave the excessive heat of the south and central parts of the country for their annual August vacation. This is illustrated by the fact that the town has a permanent population of between 10,000 and 11,000 people, but summer tourism boosts this figure to almost 50,000. Needless to say, August is not the best time to visit Baiona if you do not like crowds. Baiona has a lot of charm with a quaint fishing port, a number of small but appealing beaches, plus an old town that sits just behind the main seafront area. There are also many small beaches along the coastline within close proximity to Baiona and this is one of the reasons why it is so popular with summer visitors. Within Baiona's old district there are a number of narrow corridor like streets with typical Galician terraced houses lining them. This area is pleasant to walk around and it gets you away from the busier seafront zone which is more commercialised. There are bars, cafes and restaurants hidden away in this area and most are superior to, and often cheaper than, the ones found on the ocean front drive. 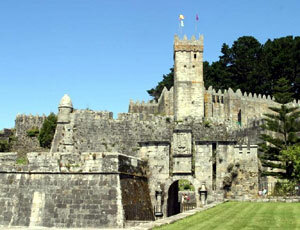 There are quite a few churches and other small buildings of architectural and historical interest, but Baiona's most prominent building is the Castelo de Monterreal, a castle that sits to one edge of the town. You can visit Castelo de Monterreal and it affords excellent views of Baiona and the surrounding coastline from its elevated position. In addition to Baiona's appeal as a beach resort, it has a stunning backdrop of hills and forests and this makes the town an ideal base from which to explore the southern and inland areas of Pontevedra, or even to cross the border in to Portugal. The cities of Vigo and Pontevedra are within easy travelling distance, as are other coastal towns like Combados and Sanxenxo. The best time to visit Baiona is outside of the main August holiday period when the town is literally packed to overflowing. Surprisingly, even in the weeks immediately before and after this month see the town sparsely visited by tourists.